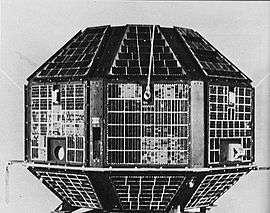 It was launched by India on 19 April 1975 from Kapustin Yar using a Kosmos-3M launch vehicle. It was built by the Indian Space Research Organisation (ISRO) to gain experience in building and operating a satellite in space. The launch came from an agreement between India and the Soviet Union directed by U.R. Rao and signed in 1972. It allowed the USSR to use Indian ports for tracking ships and launching vessels in return for launching Indian satellites. On 19 April 1975, the satellite's 96.46-minute orbit had an apogee of 611 kilometres (380 mi) and a perigee of 568 kilometres (353 mi), at an inclination of 50.6 degrees. It was built to conduct experiments in X-ray astronomy, aeronomics, and solar physics. The spacecraft was a 26-sided polyhedron 1.4 metres (4.6 ft) in diameter. All faces (except the top and bottom) were covered with solar cells. A power failure halted experiments after four days and 60 orbits with all signals from the spacecraft lost after five days of operation. According to Soviet media reports, the satellite continued to function and transmit information for some time. The satellite returned on the Earth's atmosphere on 11 February 1992. The satellite's image appeared on the reverse of Indian 2 rupee banknotes between 1976 and 1997 (Pick catalog) and one rupee note number: P-79a-m). 1 2 3 "Aryabhata" in The New Encyclopaedia Britannica. Chicago: Encyclopaedia Britannica Inc., 15th edn., 1992, Vol. 1, p. 611. 1 2 McDowell, Jonathan. "Satellite Catalog". Jonathan's Space Page. Retrieved 22 January 2014. ↑ Harvey, Brian (2000). The Japanese and Indian Space Programmes: Two Roads into Space. London: Springer. p. 134. ISBN 1-85233-199-2. Wikimedia Commons has media related to Aryabhata (satellite).